This recipe is taken from a Donna Hay recipe which uses fresh, torn lasagne sheets but Mr S misunderstood my note and bought dried pasta so I just used up the pasta we had in the pantry. I had some rocket which needed using up so I added that too. Heat some oil in a pan and cook the leek until softened. Remove from the pan. Cook the chorizo in the pan. Just before the pasta is cooked, throw the peas in and cook for a few more minutes. Drain and add the chorizo, rocket and leek. Add some of the lemon juice and some seasoning to taste. 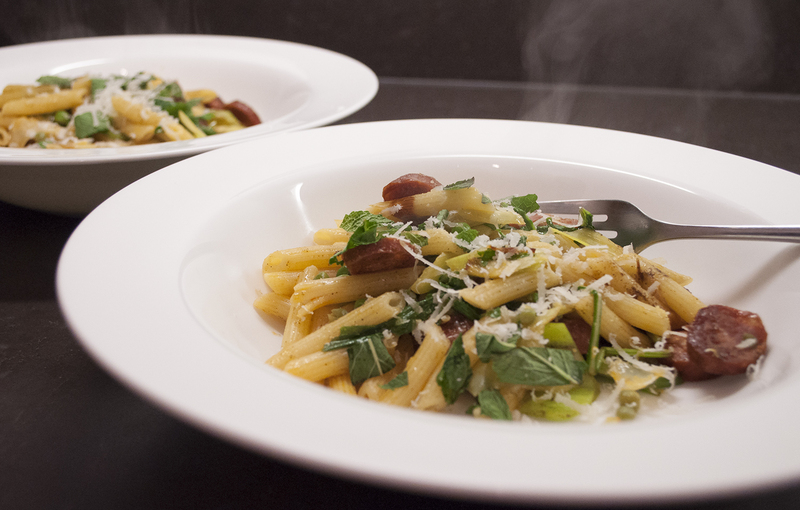 Serve with the mint leaves and a scattering of the parmesan. If it’s got peas and chorizo in it, I’m in heaven.